#17 is #18's twin brother. He is one of the androids that makes an appearance after Frieza is destroyed by Trunks. He and #18 are the strongest out of all of Dr. Gero's androids as far as I know. 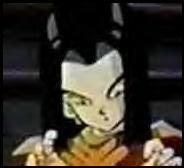 After he is absorbed by Cell, he later makes an appearance in Dragonball GT when he comes back to life and fuses with a copy of himself to become Super #17.